A 23-year-old graduate of the Ebonyi State University, Adeyinka Adelekan, will not be able to commence her National Youth Service Corps this month as planned after a sport utility vehicle knocked her down around Skiddo bus stop, Ajah, Lagos. Adelekan, who studied Geology at the university, reportedly suffered fractures in her legs and brain injuries as a result of the crash. 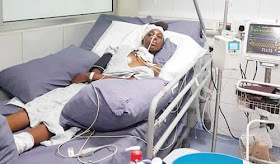 She was said to have been admitted to the Lagos University Teaching Hospital, Idi Araba, and had yet to come out of a coma since December 19, 2017, when the accident happened. Punch learnt that Adelekan was going to buy drinks for herself and her elder sister around 4pm on that day. She was reportedly standing on the median, waiting to cross to the other side of the road, when the SUV – a Toyota RAV 4 – driven by one Saviour Henry, 26, allegedly veered towards the median and knocked her down. It was gathered that Henry lost control of the vehicle while trying to prevent a Toyota Highlander, driven by one Oluwatobiloba Olorunosebi, 19, from hitting his SUV from behind. The drivers were arrested by the police from the Langbasa division, while Adelekan was rushed to a private hospital for treatment. She was subsequently referred to St Nicholas Hospital, Lagos Island, where she underwent a brain surgery and was placed in the Intensive Care Unit for over two months. It was learnt that the victim was taken to LUTH when there was no improvement in her condition despite the family spending millions of naira. The suspects, according to the police, drove without valid driving licences and were arraigned on three counts bordering on reckless driving before an Igbosere Magistrate’s Court. The defendants pleaded not guilty to the charges and were granted bail by the presiding magistrate, Mrs. O. Oshin, in the sum of N250,000 with one surety each in like sum. It was gathered that there were moves by the parties to explore settlement while the case was adjourned till June 19, 2018.